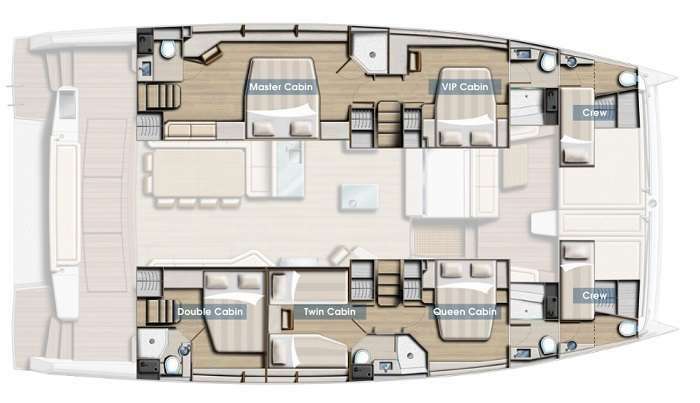 One full Master Stateroom, One VIP cabin, One Queen cabin, One Double and One Twin. All with private facilities and separate plexiglass showers. Master Stateroom offers a Jacuzzi Hydromassage shower. Giorgos (George) started in New Horizons Yachting Co from the very beginning. Throughout these four years he has shown his immense professionalism as a captain. Following his passion towards the sea from a very young age, he entered the field of of leisure yachting with utmost enthusiasm. His experience in dinghy racing and offshore sailing boats, commercial and pleasure, has given him the knowledge over different weather conditions around the world. He always maintains a tranquil vibe on board with his expertise over the sailing and technical factors of the cruise. His immaculate skills make him capable of providing top safety to the passengers and crew. He speaks English, some French and understands Italian. Moreover, Giorgos is friendly but discrete and creates a very pleasant ambience with the clients. He has a very broad knowledge over the secrets spots around the Greek islands and can give very good tips about entertainment ashore. He is a very well educated and skilled captain that will captivate you with his personality. Captain Giorgos always gives his best to endure that our guests get the dream vacations they have been looking forward to while keeping them safe at all times. He speaks very good English. Dimitris has been with the New Horizons family for 2 years. Within these two years that he has been with us, he has shown high professionalism. He is a very well educated individual that shows the utmost politeness with a truly winsome personality. From a very young age, he became passionate with the sea while sailing on board his family owned yachts on private cruises. His insight on the client view gives him the best potential to foresee the needs of each guest. He is extremely attentive and considerate. He speaks fluent English and can communicate also in French. Throughout his career he worked with various types of sailing boats. The numerous years he has spent at sea he has experienced different kinds of weather conditions which gave him the ability to be a good sailor. One of his most valuable qualities is that he remains calm in every situation and addresses every problem. Dimitris is determined to make sure sure that each guest leaves New Horizons 2 with great unforgettable memories. Elenis’ sweet smile will enchant you throughout your cruise. She’s a young powerful young lady, full of enthusiasm to please her guests. Eleni loves cooking and taking care of children. Coming from a family of Captains she has learned to love and respect the sea. Driven by her love towards the sea she joined the leisure yachting industry two years ago. Within these two years that she was onboard S/Y New Horizons she acquired her aspiration. She assists with confidence the Captain in mooring and is ready to take over any task that he addresses her with. Her cooking skills are also quite advanced especially when preparing dishes of the Greek and Mediterranean cuisine. She’s very well educated as she’s currently studying Law in the Kapodistrian University of Athens. She speaks fluent English and is very polite towards everyone around her. Eleni has quite a loveable personality and we are confident that she will do her best to make your vacations dreamy. Dive Info: Rendez-vous diving can be arranged. Other Entertain: Hydromassage Shower in Master Stateroom.